Robert Fraser (top l.) and John McDaniel III (top r.) slandered John Rogers after an FBI search yielded fake jerseys owned by Barry Halper (bottom r.) and sold by Rob Lifson (bottom l.). The big hobby news last week next to the Eli Manning memorabilia scandal was the FBI search of the Arkansas home and office of longtime hobbyist John Rogers. Sources with knowledge of the investigation confirmed that agents from the Chicago office of the FBI working on the Mastro case led the search which yielded a trove of memorabilia including items sold by REA and SCP and other bogus flannels sold to Rogers by New Jersey auctioneer Rob Lifson. A report tonight from Arkansas also reports that some items have already been returned to Rogers. The group of baseball jerseys seized in the raid were once part of the collection of hobby fraudster and Lifson associate Barry Halper and were items that authenticators rejected at the time Lifson sold Halper’s collection at Sotheby’s in 1999. Included were several bogus jerseys that Halper held out to the public as genuine including jerseys he falsely claimed were worn by Lou Gehrig at Columbia University and Hartford. A source told us that employees of Rogers’ business indicated the search was “professional and civil” and that the agents were “very accommodating.” Another source who witnessed the search said the visit had “absolutely nothing to do with the Rogers Photo Archive business” and only dealt with memorabilia collected by Mr. Rogers. News outlets in Arkansas reported that the FBI took possession of at least ten boxes of materials and Hauls of Shame has since learned that inside some of those boxes were items attributed to baseball pioneer Henry Chadwick. Rogers also purchased that material from Lifson in 2009 as part of a $550,000 court-ordered and forced sale of property that once belonged to this writer. It is not known what specific Chadwick-related materials were taken by the FBI but Rogers’ original purchase included assorted types of ephemera, documents and scrapbooks. Rogers declined to comment on the FBI searches of his home and business. Sources also indicate that when Lifson sold the Halper jerseys to Rogers he stated they did not pass authentication by Grey Flannel in 1999, but that he believed many of them, including a bogus Lou Gehrig jersey, were authentic. Grey Flannel’s Andy Imperato, Richard Russek and Lifson, however, also authenticated and sold hundreds of thousands of dollars worth of other fakes at Sotheby’s in the Halper sale including jerseys attributed to Ed Delahanty, Cap Anson, Buck Ewing, John J. McGraw, Wilbert Robinson, Hugh Jennings, Jimmy Collins, Jim Thorpe, Stan Musial, Mickey Mantle and a host of others. The Halper fakes had bogus provenance stories attached to them that were also fabricated by Barry Halper and similar to other false statements he gave to Major League Baseball and the Baseball Hall of Fame in 1998 when he sold them a counterfeit jersey, bat and glove he said once belonged to “Shoeless” Joe Jackson. Soon after the FBI search took place collectors with close ties to Lifson and REA gathered at the collector forum Net54 to proceed to attack Rogers who also owns one of the worlds largest photograph collections housed in the Rogers Archive. The forum, which also counts Rogers as a member, is moderated by convicted felon and former drug dealer Leon Luckey, who also co-owns Brockelman & Luckey Auctions. Luckey’s forum served as a platform for collectors to take shots at Rogers and publish false claims made in an attempt to link him to forgeries sold by the notorious Coaches Corner Auctions. Jay Miller, a prominent collector and co-author of The Photographic Baseball Cards Of Goodwin & Co., contributed his own post saying the accusations that Rogers is a supplier to Coaches Corner were “Hilarious.” But McDaniel, Bretta, Warshaw and others failed to reveal the shortcomings of the SCD article and the veracity of the accusations they leveled in the public forum. As confirmed by Net54 member Shelly Jaffe, the Coaches Corner LOA was a fake too. Rogers never consigned material to Coaches Corner Auctions and was, in fact, a victim of fraud at the hands of either an unknown third party or the auction house itself. The SCD article was patently false and the ball was never owned by Rogers who never did business with the notorious auction house. Jaffe was the only Net54 member to point out that the Coaches Corner LOA’s were forgeries and that Rogers had nothing to do with them. ”He (Rogers) received an email from me asking if that piece of garbage was his. He emailed CC and they took it down. He said someone used his cert. It was so bad I had to think he really had nothing to do with it.” In addition, one Net54 member who requested to remain anonymous told Hauls of Shame, “These guys are jealous of Rogers and Rogers has ruffled a lot of feathers over the years. We all know those Coaches Corner LOAs are fakes just like the memorabilia in their auctions. But that didn’t stop them from throwing him under the bus with false accusations.” In regard s to the Net54 free for all Jaffe added, “Once the chumming begins you have no idea how many sharks are on here.” Rogers declined comment for this article when we contacted him last Friday. 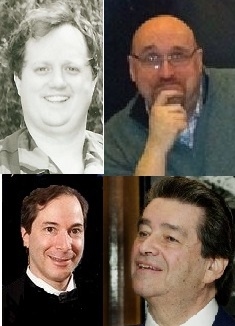 Like McDaniel, Robert W. Fraser is another close Lifson confidant who has also used Lifson’s lawyer’s services at his behest while Dan Bretta is a Net54 moderator who is aware of several cease and desist letters sent by Lifson’s attorney, Barry Kozyra, threatening legal action if members make negative comments about his client who is also well-known in the hobby as an admitted thief of rare baseball artifacts. Ex-felon Robert Fraser attempted to link John Rogers to the notorious Coaches Corner Auctions by posting a babe Ruth bat accompanied by a forged Rogers LOA. Net54 members Chris Williams and James Wymers knew the Rogers LOA was a forgery back in 2012 as evidenced in Williams' Autograph Magazine column (inset). The false accusations made by McDaniel and Bretta opened the door for Fraser, a convicted felon from Westwood, New Jersey, to post additional statements to slander Rogers. Fraser posted another bogus item sold by Coaches Corner that was described as coming with a letter of authenticity written by Rogers. 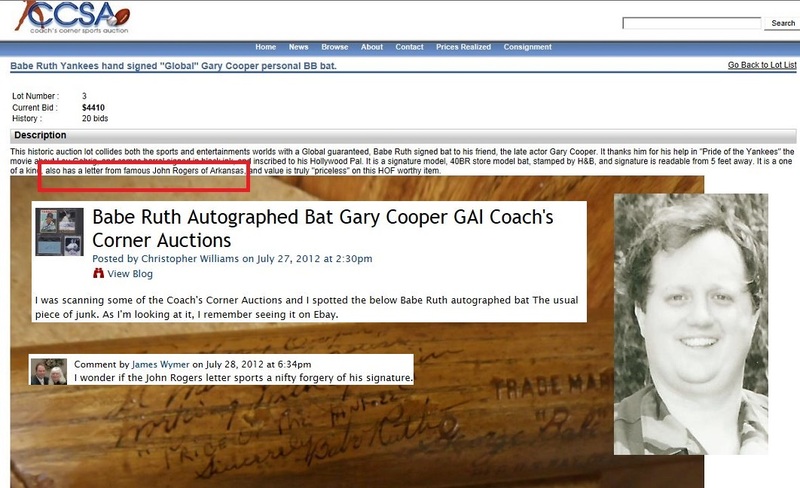 The baseball bat, alleged to have been signed by Babe Ruth to actor Gary Cooper was a fake and was never consigned or owned by Rogers. The letter with the bat was also a fraud and it appears that Rogers was a victim of fraud and not a perpetrator. John Rogers purchased this tintype of Henry Chadwick from Rob Lifson but Net54 members said the image did not include Henry Chadwick. A close up of a known photo of Chadwick (far right) appears next to a close up of the tintype image. It’s ironic that the FBI seized materials in Rogers’ collection related to Henry Chadwick and that Rogers is being attacked on the collector forum Net54. After Rogers paid Rob Lifson close to $600,000 in 2009 for a large groups of items, including the same Chadwick materials, he posted a rare 1860’s tintype photograph of Chadwick on Net54 to see if any members could identify the other men in the image with Chadwick. But to Rogers’ surprise several members responded to his post stating that they believed the photo did not depict Chadwick and was a fraud, despite the fact that the tintype originated from Henry Chadwick’s great-granddaughter, Fran Henry, who identified her own grandmother’s identification of Chadwick in pencil on the image and claimed it was an image of Chadwick. It is likely that same tintype photo is included in the group of items taken from Roger’s home or office by the FBI. Interestingly enough, two years after the Chadwick image was challenged on Net54 the same Mark Fimoff helped expose a 19th century daguerreotype owned by Shanus as a notable fraud. The image fooled the hobby and historians alike but visual evidence presented in a SABR newsletter showed that the men pictured in the image were not Alexander Joy Cartwright and his teammates from the Knickerbocker Base Ball Club. Shanus, who originally acquired the image from the Cartwright family in Hawaii, had held the image out as an authentic example depicting Cartwright and placed the image in Ken Burns‘ PBS film, BASEBALL, scores of baseball books and even an exhibit at the Baseball Hall of Fame. Despite all of the visual evidence showing that his image does not depict Cartwright, Shanus did not admit that his prized dag, once highlighted by Smithsonian, is a fraud. Corey Shanus still claims this bogus daguerreotype depicts HOFer Alexander Cartwright depite the fact it bears no resemblance to a real portrait of Cartwright (inset center). Shanus' collection is also riddled with items stolen from the NYPL lincluding two 19th century Knickerbocker letters (above, right) he showed of in the book "Smithsonian Baseball." Shanus’ collection is also notorious for including artifacts that were owned by Henry Chadwick and later stolen from the New York Public Library’s Spalding Collection. Shanus showed off two Knickerbocker Base Ball Club documents stolen from Chadwick’s collection in the 2005 coffee-table book Smithsonian Baseball. Those documents were bequeathed to the NYPL in 1921 by the widow of A. G. Spalding and are also the subject of an on-going FBI investigation. So far, there have been no reports of Shanus’ home in Purchase, NY, being raided by FBI agents as part of the same Federal investigation. Shanus has also filed suit against the only person ever apprehended stealing rare artifacts from the NYPL, Rob Lifson of Robert Edward Auctions. Shanus filed a complaint against Lifson in 2011 alleging that Lifson and his auction house sold him counterfeit items including an 1853 Knickerbocker trophy ball (alleged to have been presented to Henry Chadwick) and an 1861 trophy ball from a match between Brooklyn and New York “all-stars.” (This writer purchased that same 1861 ball at Sotheby’s Halper sale in 1999 for over $60,000. Shanus notes in his complaint that these items were once owned by this writer.) Shanus also accuses REA of defrauding him and inflating memorabilia prices by falsely reporting record sales of rare baseball artifacts. The complaint does not charge Lifson with selling Shanus any items that were stolen from the NYPL’s famous Spalding Collection. Sources also indicate that Shanus claims to have unearthed evidence in discovery suggesting that Lifson has been involved in a shill-bidding scheme in his own auctions with a relative. Despite Lifson’s lawyers claims that the charges against his client have no merit, Lifson has had a well-documented history of selling bogus and fraudulent materials. In the 1999 Halper sale Lifson catalogued and sold fake uniforms, misrepresented game-used equipment, forged Babe Ruth autographs and even a phony 1846 Knickerbocker baseball he claimed was genuine. Whew! This should bring a comment or two on the big five four. Thanks for the wake up call. Big five four is too busy talking about tropical storms and making ‘cute’ statements to do any investigating. Rogers was guilty until proven innocent, an all too common occurrence. “So, the 1865 Atlantics carte de visite, while a great item, doesn’t meet the standard definition of a baseball card.